This card is included in the Crazy Crafters Team Highlights. Click here to see the full array of wonderful projects and vote for your favourites. In a previous post I shared a background that I made with Brusho Crystal Colour and a baby wipe on watercolour paper. I made the background for this card at the same time, using the same method but on Glossy White Cardstock. The base card is Dapper Denim with a layer of Marina Mist cardstock. 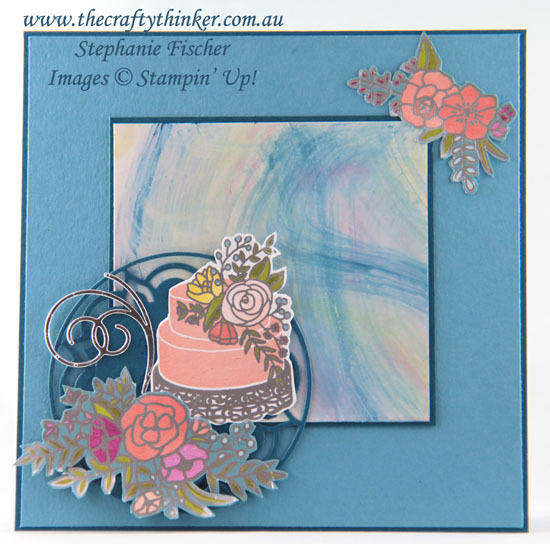 I fussy cut elements from a piece of the gorgeous Sweet Soiree Designer Series Paper and layered some of them onto a decorative circle cut from Dapper Denim cardstock with one of the Eastern Medallions dies and a Layering Circle Framelit. I also added a little silver flourish cut with one of the Swirly Snowflake dies.